Wilson Peters with Cheeky Kiss. Fresh from his win at Livescot on Saturday, Wilson Peters made the long journey from Crieff to Thainstone worthwhile by winning the overall champion at yesterday’s Christmas Classic with a home-bred heifer. Wilson runs 200 cows at Monzie and this 610kg three-quarter Limousin heifer, Cheeky Kiss, by Anside Hawkeye was also first in her class at Livescot at the weekend. She later sold for the day’s top price of £4,600 (754p/kg) to the judges – Hugh Black, Lanark, and Murray Lauchlan, Comrie, who are taking half each for their respective shops . Reserve overall, and following the champion through from being second in her class, was a 634kg British Blue cross Limousin heifer known as Sarah from David and Neil Work, Mains of Dumbreck, Udny. This one was bought at the Spectacular in August for £2,100 from Balfour Baillie, Orkney, and sold yesterday for £2,600 (410p/kg) to Hugh Black. Last year’s overall winner, Harry Brown, Auchmaliddie Mains, Maud, settled for being top steer with his 615kg Limousin cross, Louis, bred by John and Craig Robertson, Newton of Logierait, and bought for £1,300 at the Spectacular. Scott Watson bought this one for £1,722 (280p/kg). Reserve steer was Wee Donald, a Limousin cross steer scaling 710kg from Donald Morrison, Nulla, Kinlochbervie. Bought at the Spectacular for £1,500 in 2017, this calf won the crofters’ championship at Sutherland Show in the summer and was unsold at the sale. In the butchers section, results were reversed with the Work brothers taking the championship with their 575kg Balfour Baillie-bred three-quarter Limousin steer, Harvey, bought for £1,350 in August. He made £3,000 (522p/kg) to Forbes Raeburn Butchers, Huntly. 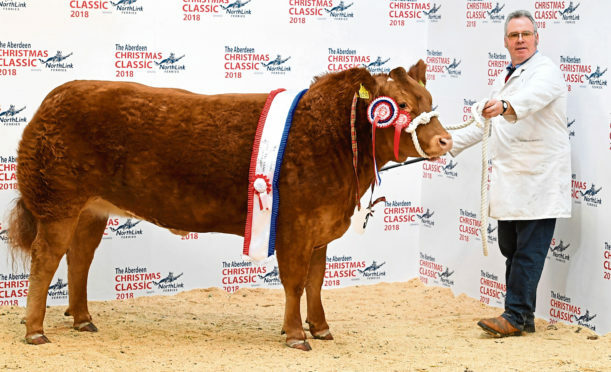 Reserve was Wilson Peters with Cotton Tail – a 570kg home-bred Limousin cross Simmental heifer which later sold for £2,300 (404p/kg) to Alastair Bruce, Fraserburgh. Meanwhile, a pen of two Suffolk cross lambs won the overall sheep championship, which is the first time for a number of years the top prize has gone to a Down-sired pair. Judges Louise Forsyth and Ben Wight were representing butcher and farmer but they said they were in total agreement throughout the judging and that the champion lambs handled really well and had a nice length about them. The 56kg lambs by a home-bred Suffolk tup were out of a Texel cross ewe and were shown by father and son duo, Willie and John Brown, Hilton of Culsh, Turriff. They made the top price of £200 each to the judge, Louise Forsyth for WTS Forsyth Butchers, Peebles. John was delighted to take the double in the young farmers classes by winning champion with his 43kg Beltex cross lambs which later sold to J Gordon and Co, Alford, for £170 each. He was also reserve with a pair of 55kg Texel cross lambs which made £130 each to Hugh Black. Overall reserve were Calum and Samantha Angus, West Mey, Thurso, with a pair of Beltex cross lambs scaling 46kg which sold for £150 each to John Scott Meats, Paisley. The well-supported butchers lambs class was split into three and it was Rory Gregor’s lightweight Beltex cross lambs by his home-bred Gregor’s Brutus from Ranch House Cottage, Thainstone, which took the championship. These lambs weighed in at 42kg and sold for £180 per head to I J McIntosh, Fraserburgh. Reserve was another pair of Beltex lambs from the Angus family at Mey. They came from the heavyweight class, scaling 50kg and sold for £130 each to Louise Forsyth.